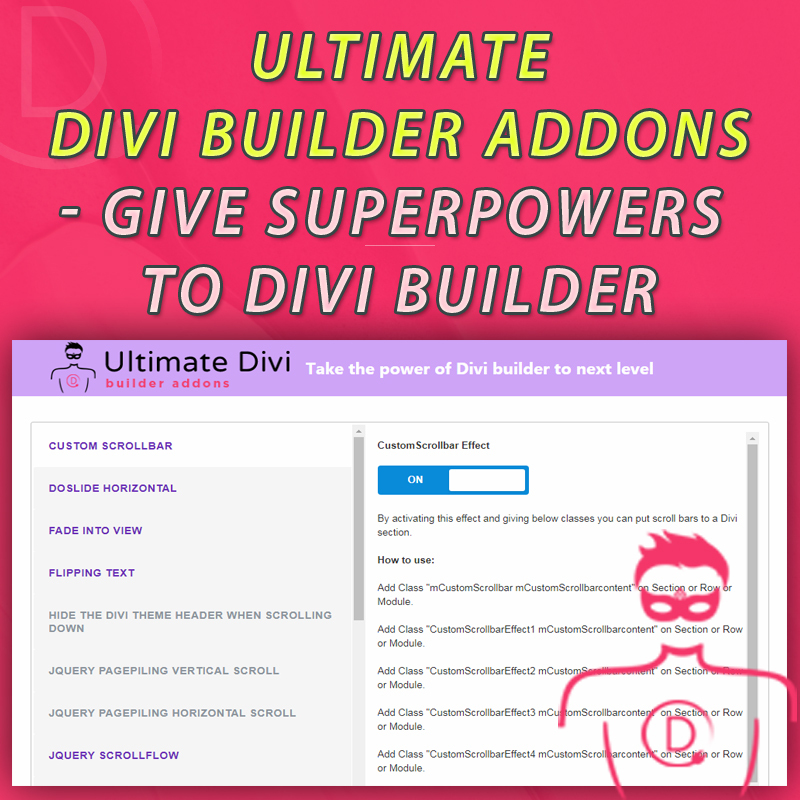 Ultimate Divi Builder Addons - Give superpowers to Divi Builder! 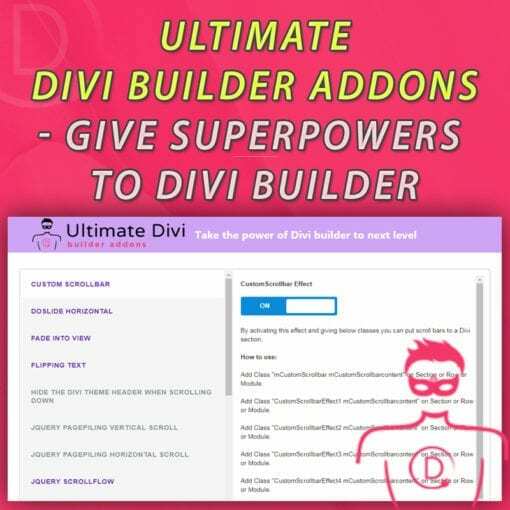 Take the power of Divi builder to next level with Ultimate Divi Builder Addons – UDBA. You can activate popular jQuery libraries that used by million dollar websites with a switch of toggle. Currently there are 23 effects included in the plugin. You can use these effects on a page or theme template files. ‘Ultimate Divi Builder Addons (UDBA)‘ is the plugin that help you to re-create amazing effects you see in popular websites right inside Divi builder. 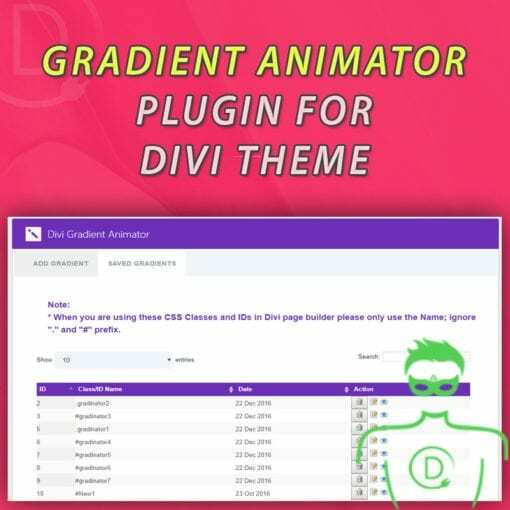 We all know Divi theme is a great tool to build web sites. The page builder is easy to use and intuitive. Theme customizer, the epanel allow to customize the design of your site easily. There’s one problem though, and it’s a big problem! When you look at all the sites built with Divi theme, they all look the same. You will need many lines of custom code to change default Divi theme look. You can never achieve the design and functionality of those popular sites that clients are willing to pay millions of dollars without hiring an expert developer. Let’s face it, If you are using a drag and drop page builder based WordPress theme like Divi, you should be able to create your masterpiece without touching a line of code. So, Are you a Divi web designer tired of giving same old designs to your clients? Don’t worry, you won’t be need to learn custom code or hire an expert developer anymore. All you’ll need is ‘Ultimate Divi Builder Addons – UDBA‘ plugin to help you create stunning web pages with switch of a toggle! ‘Ultimate Divi Builder Addons’ (UDBA) allows you to activate popular jQuery libraries that used by million dollar websites with switch of a toggle. Currently there are 23 effects included in the plugin. You can use these effects on a page or theme template files. Add mobile responsive custom scroll bars to any builder element. Please note that you have to remove any element animation in the builder to make this effect work properly. There are 8 scroll bar designs to chose from. 1.2 Hide the Divi Theme Header when Scrolling Down : You can make the header hide when scrolling down and appear it when scrolling up. Create a mobile responsive loading header effect while you scroll. This effect can used as a reading progress bar indicator showing the user how far scrolled through the current post or page they are. You can chose the color for reading progress bar. There are 4 effects to chose from. By using this effect you can have your visitor focus on particular sections of the page. The user can scroll through the page but at the end it will always come back to the nearest section where “window” CSS class is held. You may want to use ‘Hide the Divi Theme Header when Scrolling Down’ to make this effect appear better for the viewer. Make elements fade in and out of view when they enter/exit the window. Works best with dark backgrounds. Add real time typing animation to Divi text module. It creates a ticking intro animation for your typography. You can adjust the font from Advanced Design Tab of the Text module. Nice scroll animations to add to any Divi Module or Row. These animations works both page scroll up and down. You have 5 animations to choose from. Scroll fx is a jQuery effect for smooth scroll-triggered animations that allows scaling text and changing the background opacity as you scroll pass them. 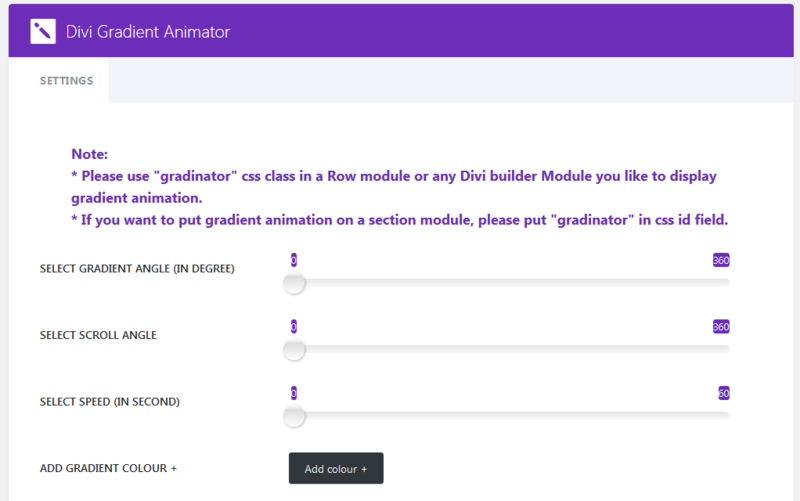 Animate any Divi module with nice slide in animation. This works with both page scroll up and down. Viewport Triggered Element Animations. These animations works both page scroll up and down. You can choose from 9 animation types. This effect works best with Button or Call to Action modules. It creates nice zoom in and out animation to these modules as the user scroll through the page. Scene duration depending on viewport size. Reveal modules on scroll. These animations works both page scroll up and down. There are 17 animation effects to choose from. CSS animations as you scroll down a page. You can animate any Divi module with this effect. You need to remove all default animations in the builder in order to make this effect work. You have total 75 animation effects to choose from. Add a super simple rotating/ticking text to your website with little to no markup. You have 5 text animations to choose from. You can use these animations to any Divi module that has a text field. Use commas (,) to rotate texts inside span class. A jQuery effect that creates a stacking effect by sticking panels as they reach the top of the viewport. You may want to activate ‘Hide Divi Theme Header when scrolling’ to make this effect appear better. 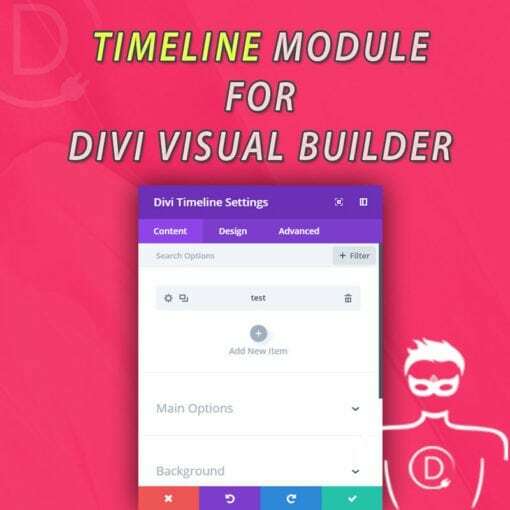 There’s a conflict with Divi slider module. Activate ‘Remove this effect in small screen sizes’ option if necessary. Wiping in content with the natural scroll movement. This effect is similar to Stacking Effect mentioned above but it doesn’t have the conflict with slider module. You need to use this effect from second section onwards. This effect is not mobile optimized so you may want to enable ‘Remove this effect in small screen sizes’ option. This effect will let you add an end page box that will display when scrolled to the bottom or in any range on the page. This effect creates responsive scrolling stack of pages. This is the effect to use if you want to build a one page scrolling page like ‘tumblr’ home page. Don’t activate page Piling Vertical scroll and page Piling Horizontal Scroll at the same time, It creates conflicts. This effect creates vertical scrolling for each section that has the CSS class. Use single module inside a section for best results. Activate ‘Remove this effect in small screen sizes’ option if necessary. This effect creates responsive scrolling stack of pages. This a new way to create a single scrolling page in which sections are piled one over another creating an original effect to present the information. You can use this effect to showcase your image gallery in a very attractive way. This effect creates horizontal scrolling for each section that has the CSS class. Use single module inside a section for best results. Don’t activate Page Piling Vertical scroll and Page Piling Horizontal Scroll at the same time, It creates conflicts. Activate ‘Remove this effect in small screen sizes’ option if necessary. DoSlide is a javascrit library for full-page section scroll or horizontal slider. You can use this to have scrolling effect inside a Divi builder section. With each mouse scroll user can navigate next modules inside a row. The user can scroll through modules in the same section without having to scroll the entire page. This effect is not optimized for mobile display so you may want to enable ‘Remove this effect in small screen sizes’ option. * Fixed Wow Animations Error. * Fixed Stacking Effect Error. * Added an option to exclude following effects from happening in small screen sizes – When enabled effects only show up after a defined screen size (media query). 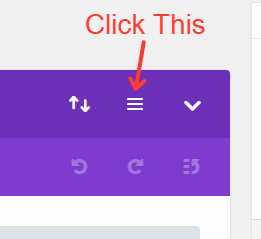 If you are seeing the page you setup with this effect is scrolling downward before moving into next slide then please add following CSS code to page options panel. This will make sure your slide transition smooth and looks like our demo. You can adjust the height base on your requirement. Please use ‘Default’ page template when using these effects in a page. The ‘Blank’ page template creates conflicts. Excellent plugin for adding some really interesting effects to your Divi based website.